When I was applying for colleges a little over four years ago, I was fortunate enough to already know what I wanted to do with my life and where I wanted to go to help make that a reality: the University of Kansas. Contrary to popular belief—or rather what my favorite teacher, Mr. Clark, thought—I didn’t simply want to go to Kansas for college just because it’s Kirk Hinrich’s alma mater. That just happened to be a wonderful perk. As an aspiring sports writer, KU’s prestigious journalism program was attractive. As a basketball fanatic, I wanted to go to a basketball school, and KU is pretty much the definition of that considering the men’s basketball team’s great history and success. Kansas seemed like the perfect place for me to be, and I was convinced it was despite never having even gone on a visit there. When I told my friends and classmates my reasoning behind it, they understood and saw why I’d fit there. So I applied to the school as a journalism major, received my acceptance, and was even offered a scholarship. I’d hear from with representatives from the school who would mention also loving Kirk Hinrich (Thanks to social media it was no secret Kirk was my favorite). I was happy about the prospect of my future and was hopeful that I’d get my perfect college experience. But I never went to Kansas. I never even went down to Lawrence to visit the campus. I went to the only other school I applied to: the University of Illinois at Urbana-Champaign. I wasn’t necessarily disappointed that I wouldn’t be going to Kansas as much as I often wondered what I’d be missing there. I still think about that from time to time, but I thought about it a lot more when I was a college freshman. Now, as a very recent college graduate of Illinois, I hardly ever think about it. Instead, I think of how grateful I am to have gone to Illinois, to received all of the opportunities I’ve gotten there. Instead, I think of how different my life would be and how I wouldn’t be the person I am today if I hadn’t gone to Illinois. Even though my hopes of going to Kansas didn’t become a reality, I was still optimistic about going to Illinois and pursuing journalism. I got into Illinois as a news-editorial journalism major and planned on working for U of I’s student-run newspaper, The Daily Illini. I was so eager to join that I inquired about applying for the paper before my senior year of high school ended and applied soon after graduating high school. It was well worth it, as I was eventually hired to work on the sports staff in my first semester on campus. I was placed on the Illinois women’s golf beat and, despite my mere basic knowledge of the sport, I was excited to work for the paper, to be one of the fortunate students chosen to work for the sports staff. Later on in my first semester at U of I, I was asked whether I would be interested in covering the Illinois women’s gymnastics team. I was hesitant about having that beat because my twin sister, Amanda, had applied to write for the DI specifically with the hope she’d get to cover the women’s gymnastics team. She wasn’t hired, and so I felt I’d somehow be betraying her if I were to be the one to be the women’s gymnastics beat writer. I said I would cover the team, though, if it was needed of me. So, come the winter semester, I was placed on the women’s gymnastics beat, adding on to my responsibilities at the DI. At first, I wasn’t completely confident in my ability to handle schoolwork and covering both the women’s golf and women’s gymnastics teams—not to mention I was also working as a photographer and designer for U of I’s yearbook, Illio Yearbook, and was still working as a staff writer and social media reporter for FanSided’s Pippen Ain’t Easy. I didn’t want to pass up on the opportunities the DI was offering me, but I also didn’t want to take on too much work. Thankfully, I somehow managed to do all of it—school, the paper, yearbook, PAE—and I did it all relatively well. Covering two beats that spring 2014 semester helped me become a better reporter and writer and helped me learn to manage my time better, but what stands out most to me about my time at the DI is how much covering the women’s gymnastics team affected my life. Before I was ever a gymnastics reporter, I was a semi-casual fan of (artistic) gymnastics; I thought the sport was cool but wasn’t into it a lot. My twin sister, Amanda, started becoming a fanatic of the sport toward the end of high school, so I became more familiar with it then—enough to say that vault was my favorite event and that McKayla Maroney was my favorite gymnast. Other than that, though, I didn’t know much else about gymnastics other than the basics, like that female gymnasts compete four events. Once I was assigned to cover the Illinois women’s gymnastics team, though, that had to change: If was going to do my job well, it was imperative that I really learn the sport. My basic knowledge wasn’t going to cut it. Well, maybe it would have, but I wanted to do the best job I could. Fortunately, having a gymnastics fanatic for a twin sister made this easy. I learned the more intricate details about gymnastics, like what constitutes a good routine or what the names of certain skills are. The more I learned, the more I wrote, and the more I spoke with the gymnasts, the more I became a fan of gymnastics. I learned to appreciate more than just vault and the speed, power, and fearlessness that comes with competing such an event. I learned to appreciate the fluidity and lines needed to perform well on uneven bars. I learned to appreciate the difficulty that comes with flipping and leaping on a four-inch wide beam. I learned to appreciate the expression, musicality, and tumbling that floor routines offered. Most importantly, I learned to appreciate the people I spoke with and the relationships I formed with them, and the chance to get to know them as not just gymnasts but people, too. I even befriended some of them, and I’m glad they saw me as more than just a reporter but also took an interest in me as a person. I enjoyed that first season of covering the team so much that I covered the team for another season—an uncommon thing to do at the DI. If I hadn’t gone to Illinois, I never would have had the chance to cover gymnastics and become an actual fan of the sport, nor would I have befriended the few of them that I did. But I’m thankful that’s not the case. The first extracurricular activity I became involved in at Illinois was the Illio Yearbook, the school’s official yearbook. It was one of the things about college I was most looking forward to because I loved yearbook. It had been a part of my life since my junior year of high school, and I was ecstatic that I could continue doing it in college. Many universities don’t have a yearbook, so going to Illinois provided me the opportunity to continue doing yearbook. This is one of the things about Illinois I’m most grateful for, because it also gave me the opportunity to do something I never thought I could do: be the co-editor-in-chief of a publication. A yearbook isn’t the most prestigious publication to be in charge of, but I’m proud to say I, along with Amanda, was in charge of one, and the one I was in charge of covered a university of over 44,000 students. I never thought I’d want to be Illio editor-in-chief—let alone the editor-in-chief of any publication—but, as my college career went on, I became intrigued by the idea of having creative and editorial control of the yearbook. So I eventually decided it was an opportunity I couldn’t pass up. I’m a firm believer that everything happens for a reason, so I figured one of the reasons I ended up at Illinois was so I could continue to do yearbook. With that came the opportunity to be editor-in-chief of a yearbook, and I’ve loved it. With my twin sister’s input, I designed a yearbook cover, various layout designs, and yearbook elements; hired and managed a staff; edited and finalized photos and stories. Just yesterday, we submitted the final pages for the 2016-17 book, and it was surreal knowing that was it. As I looked through the ladder and saw all of the pages that had been done—from Homecoming to Mediapalooza to men’s basketball—it was difficult to believe that I helped all of that become a reality, that this book was going to be a reality because of the work Amanda and I did. There were a lot of stressful moments spent worrying how work would get done and some late nights at the office spent trying to make deadlines, but it was all worth it. And I’m sure it’ll all be even more gratifying when I have the yearbook in my hands. If I hadn’t gone to Illinois, I never would have continued doing yearbook, I never would have been editor-in-chief of Illio, nor would I have realized my capability to take on huge a grand responsibility. But I’m thankful that’s not the case. At the start of my junior year, I, despite not knowing how much free time I would have, decided to join another student organization on campus. The organization had nothing to do with my major or what I wanted to do as a career, but it ended up being one of the best decisions I’ve ever made: joining To Write Love on Her Arms’ UIUC UChapter. Although I had already met plenty of good people and were surrounded by ones at Illio and especially at the DI—where the sports staff is considered a family—I didn’t have the true sense of community that I wanted. Much of this was because of my introverted nature; It was much easier for me to open up to and get to know people because the UChapter was a small but quality group. It also helped that I already had a friend in the UChapter, Carly, who actually convinced me to join. The UChapter is an extension of the main To Write Love on Her Arms organization—a mental health organization that I’ve been familiar with since middle school—but it wasn’t until college that I really learned to appreciate TWLOHA and its purpose. And the more I became involved with the UChapter and the more I learned about mental health in general, the more I appreciated getting to be a part of a group that tries to make such a difference. Being a part of the UChapter was also a nice change of pace from my journalistic extracurricular activities and offered opportunities I never thought I’d had: The group brought mental health advocate and writer Kevin Breel to campus for a lecture and book signing helped make bringing TWLOHA founder, Jamie Tworkowski, to campus as part of the One Book One Campus event. I wouldn’t have met either of those two great guys if not for the UChapter, if not for Illinois. But what I enjoyed most about being a part of the UChapter was the people, the community I had there. I grew closer to my now-best friend, Carly, because of the UChapter, and I got to really know the other members in the group, too. UChapter meetings were always something I looked forward to because of the people I’d get to see. They’re what made TWLOHA great for me; getting to learn more about mental health and try to help others was just a plus. But now mental health is a legitimate interest of mine—particularly in relation to sports. Before the UChapter, I felt like my only real interests were sports (mostly basketball) and writing/journalistic activities. That’s not the case anymore. If I hadn’t gone to Illinois, I never would have joined a UChapter, come to truly appreciate TWLOHA’s work, developed an interest in mental health, nor would I have found the sense of community I had with the UChapter. But I’m thankful that’s not the case. I know it’s a cliché for people to find lifelong friends in college, but even that cliché wasn’t enough for me to ever think that would happen to me. That’s not to say I didn’t expect to make any legitimate friends in college, because I hoped for that. I longed for that: meeting even just one person who’d become your lifelong friend. But I would be content simply making good friends and not just good acquaintances. I didn’t need or expect to befriend anyone and have them eventually become a best friend to me. After all, I already had my best friend with me at college—my twin sister, Amanda—and, as long as we had each other, we would be okay. I just knew it would be nice if I had someone at college I could, at the least, occasionally hang out with. Not only was I wrong in finding someone who became my best friend, but I found someone who has become the truest friend I have ever had: my book-loving, fellow TWLOHA-supporting, fellow twin, and former gymnast friend, Carly. I first met Carly during the second semester of sophomore year, the spring 2015 semester. She came over to my and Amanda’s suite because she and Amanda were going to watch gymnastics. When Amanda initially told me about Carly, I felt a bit conflicted. I was happy Amanda had found a friend who was just as into gymnastics as she was, and it was cool that she was a twin, too. But I was definitely jealous: I had wanted a friend who was just as into the NBA as I was that I could just hang out, watch, and talk basketball with. I didn’t really have that, yet Amanda found a friend who loved gymnastics just as much as she did even though gymnastics isn’t a mainstream sport. I became a lot closer with Carly than I ever thought I would, though, and a lot of that had to do with our common interest in To Write Love on Her Arms. Once I joined the UChapter, we started spending more time with each other, thus getting to know each other better. It also helped that she lived across the street from me our junior year. Eventually, despite us both being introverts, we found that we were comfortable enough with each other that we could simply be ourselves and not worry about judgments. She’s the one person—aside from Amanda—I can be completely honest with. Sometimes, Carly would even ask me about basketball, because she wanted to learn more about it, knowing how much I loved it. That alone meant the world to me, because I’d had friends before who, when I’d even briefly talk about basketball, seem uninterested—though I’m sure it was unintentional. Regardless, it meant a lot to know someone had been taking an interest in me and my own interests even if they weren’t shared interests. Amanda, Carly, and I became that group of friends I had always wanted. And I didn’t mind one bit that it was a small group, because we were all one another’s go-to people. I wouldn’t have survived college without either of them. If I hadn’t gone to Illinois, I never would have met Carly, nor would I have made the truest friend I’ve ever had. But I’m thankful that’s not the case. 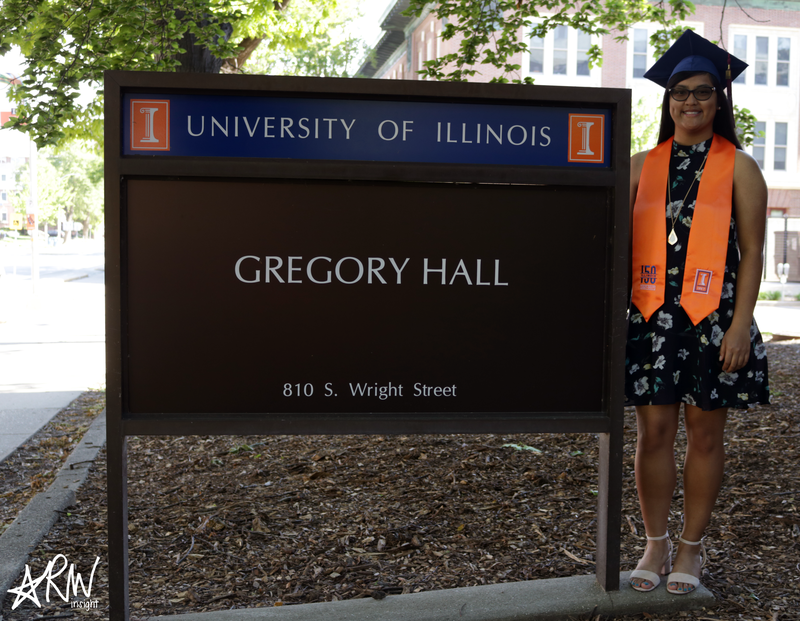 So much has happened in the four years I’ve spent at Illinois, and so much of it would have never happened if I went to Kansas. In a sense, I would be such a different person because there would be so many experiences I never would have had. And even though I’ll always have my “What ifs” concerning Kansas, Illinois has offered me more than I ever thought it could. Illinois happened for a reason—a multitude of them actually—and, because of that, I’ll be forever thankful that I went there.